Aviation, Strength, Impunity - these three concepts evolved and inspired us to create a celebration champagne bottle. The two messages displayed "Keep up the good work" and "uplifting"; represent dedicated control center and are aimed to provide conviction and good spirits. 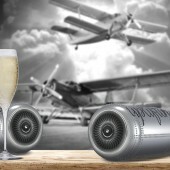 A Champagne Bottle designed for special events, inspired by the freedom and rigor of advanced flying. Visual territory alongside with specific details as linear clinchers give salience to the aviation motive. The Champagne Bottle dignifies through its specific color and material. The interaction between the bottle and the consumer is not an unusual one. Tinny look and feel alongside with well displayed messages are the key frames of the product which can tell the story by itself. The project started in september 2015 and around 20 December 2016 we had the final product. Glass champagne bottle covered in metallic sleeve with rivets. Ampro Design exudes passion in every aspect regarding work. A new project is another journey and we love to have that panoramic view because it really helps us to evolve and readjust the location line. Aviation is not only the source of our inspiration, it became a way of drifting, drawing line in the sky and coming back to earth only for taking the air again with a new enthusiasm refill. The purpose for this design was to express our gratitude for well turned out projects. We had imprinted in mind the route for strategic and artistic development but only one bottle had the mission to concentrate all particularities. So we had to simplify, to choose the right messages and to render a lot. 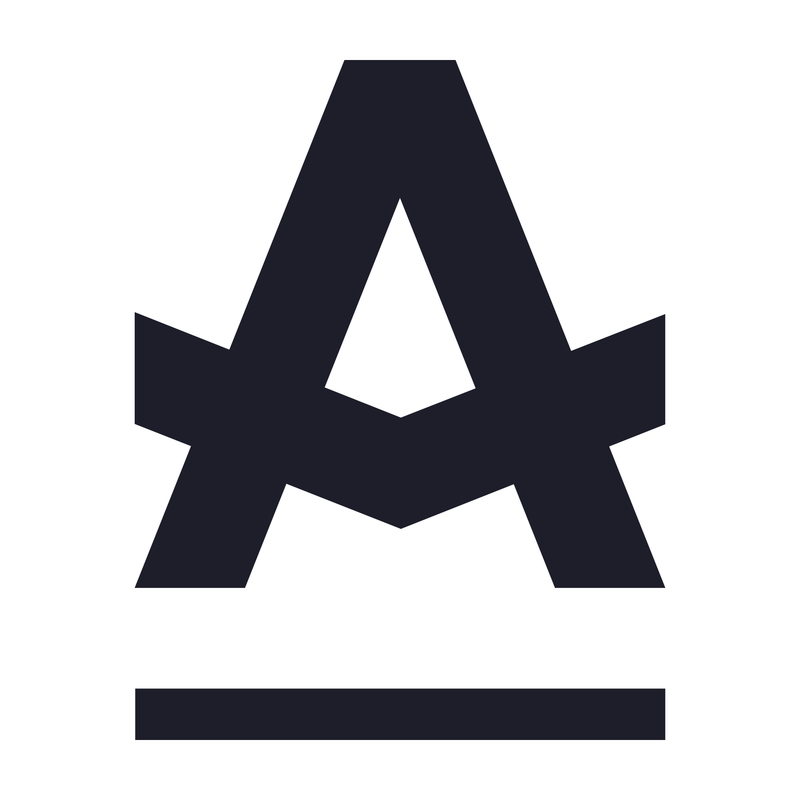 Established in 2005, Ampro Design is the top award-winning design studio in Romania that offers the full range of branding services. At Ampro, we believe that today is what matters most and the future will be at least as good as the opportunities that we seize today. We dedicate our time to helping the products and services of our clients in order to make them more visible and marketable; we do this by finding the clearest brand strategies brought to life by daring and innovative design solutions. We think outside the box! 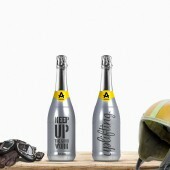 Selfpromo Champagne Bottle by Ampro Design is a Nominee in Packaging Design Category. 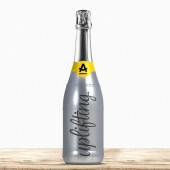 Selfpromo Champagne Bottle by Ampro Design is Winner in Packaging Design Category, 2015 - 2016. Did you like Selfpromo Champagne Bottle? Help us create a global awareness for good packaging design worldwide. 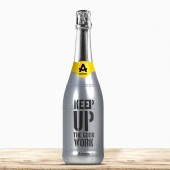 Show your support for Ampro Design, the creator of great packaging design by gifting them a nomination ticket so that we could promote more of their great packaging designs.